Exotic species of flat mite pose a significant threat to USA’s biosecurity both as plant pests and as vectors of plant disease; however, the available diagnostics do not allow accurate and reliable identification of species. This tool is aimed at enhancing our diagnostic capabilities for key taxa and to ultimately allow plant protection and quarantine services to develop rapid solutions to serious biosecurity threats. The necessity to accurately and efficiently identify intercepted flat mites will increase as globalization increases. 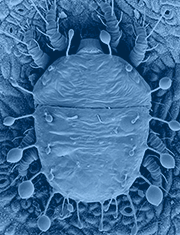 Flat Mites of the World provides a portal to a variety of keys, images, and fact sheets to help support identification of this diverse, potentially destructive group of mites. This tool is designed to help identify any flat mite to the taxonomic level of genus, and in some cases to species, without the need for expertise in the group. Target users include USDA-APHIS pest survey specialists, ports of entry inspectors, other inspection personnel, students, and scientists. The “Is it a flat mite?” page provides information on how to distinguish a flat mite from other members of the spider mite superfamily Tetranychoidea. Please click here to see a Spanish version of the announcement for the first edition of this tool, released in March 2012. The key is designed for users with limited knowledge about the group to identify flat mites to genus (and to identify critical genera to species). All characters are best observed using DIC (differential interference contrast) on a compound microscope. Ideally the user should have access to a compound microscope with a magnification capacity of 1000X (10X eyepiece + 100X oil objective) with DIC. The microscope images provided in the key were taken using DIC, mostly at 1000X. We highly recommend the use of DIC over Phase Contrast for identifying mites as the optical properties of DIC allow a more accurate interpretation of mite morphology. Please see the “DIC VS Phase Contrast” page for more information.